Bradbury, ever the keen observer of human nature, noted that many of us often feel that we’re taking history on faith. It can seem unreal; too distant to be relevant. The further back in time we ask our imaginations to stretch, the less we feel we truly know that history happened (as we know who our grandparents are) and the more we believe in its events in an abstract way (as we believe in the existence of quarks and neutrinos, say, or in dark matter). And such a shaky belief in the past can prove immensely perilous when planning for the future. However, not all civilisations have suffered from this problem. 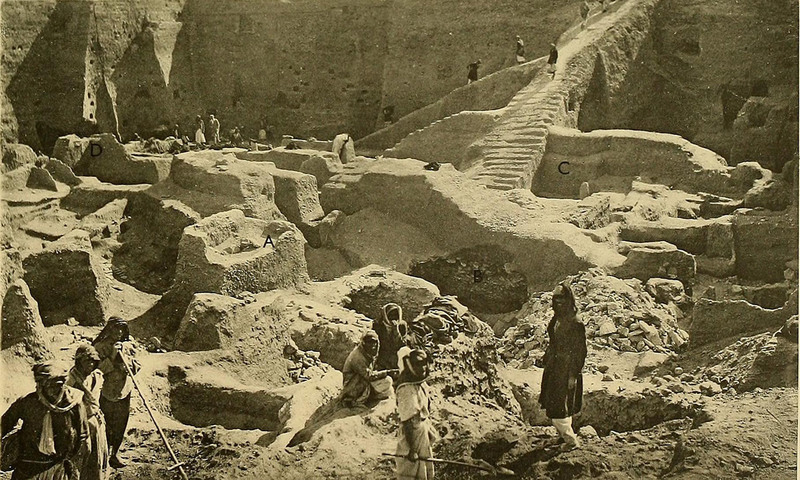 In the 1920s, the British archaeologist Leonard Woolley discovered an ancient temple complex in the ruins of the city of Ur, in what’s now southern Iraq. While the complex’s most recent layers were ‘only’ 2,500 years old, these were built atop crumbling ruins dating back hundreds of years earlier, which were in turn built upon ruins older still – all the way back to the 3800s BCE, the mist-shrouded dawn of literate civilisation, when the Sumerians laid the bricks of their first cities. In the depths of that temple’s library, Woolley and his team broke into a strange, many-shelved chamber filled with tablets and texts. The excavators could scarcely guess that room’s true significance. For as Woolley and his companions began to catalogue their findings, they realised that many of the artefacts already bore tags and numbers – ancient ones, stamped in clay. The archaeologists had stumbled on the ruins of the world’s first archaeological museum, where a Babylonian priestess named Ennigaldi-Nanna organised, translated, catalogued and categorised hundreds of artefacts from excavations across Mesopotamia. Throughout the 600s and 500s BCE, Assyrian and Babylonian emperors such as Ashurbanipal and Nebuchadnezzar financed and supervised archaeological digs at revered sites throughout Mesopotamia. Ashurbanipal constructed a vast private library, and even shipped in Egyptian and Hittite scholars to translate texts and transcribe oral traditions from their own civilisations. His goal, as recorded in his own inscriptions, was to possess a copy of every text and oral tradition in the history of the world. While he died without achieving this aim, the emperor did succeed in assembling more texts than the Library of Alexandria. At the bottom of many texts in his library, Ashurbanipal (or his scribes) added the poignant codicil: ‘[This text is preserved] for the sake of far-distant days.’ This is far more than just a ‘do not disturb’ sign on a tomb, or a dedication ‘for posterity’. It was an explicit acknowledgment that these texts would be curiosities for other civilisations, hundreds or even thousands of years in the future. As it turned out, of course, Ashurbanipal was even more right than he could have guessed. Living as they did among 2,000-year-old ruins and inscriptions, educated ancient Mesopotamians recognised that, even if their kingdom thrived for a millennium, it too would someday suffer the same fate. Mesopotamia weathered not one, but two dark ages in its tens of centuries of literate history. Surrounded by these cautionary tales from the distant past, Mesopotamian scribes instinctively dispatched messages to their unborn descendants: Voyager Records hurled toward a future they knew they would never see. In fact, to many people who grow up in the United States (myself included), the Old World tends to feel like a sort of fantasy kingdom. We read about places such as Rome and Cairo, and look at the beautiful illustrations of colonnades and pyramids, and it all seems to be happening on another world from ours, with its glimmering skyscrapers, sprawling malls and purpose-built fast-food restaurants. Three or four centuries is about as far back as our intuitive sense of reality reaches – and 1,000 years feels like an almost mythically long time. Eventually, though, some Americans (myself included) take trips to lands filled with reminders of the distant past. It can be profoundly disorienting: these ancient cities are actually there. We find ourselves gazing at mythical names such as ‘Athens’ and ‘Rome’ on digital train timetables. We talk with people for whom these fabulous lands are just ordinary, everyday places. We meet families whose ancestors have lived in these cities for centuries; people who still speak the same (or similar) languages as the people who lived there 2,000 years ago; people who attend universities founded in the Middle Ages, and live on streets paved with ancient Roman marble. In those moments, we children of an infant culture suddenly awaken – often for the first time in our lives – to a world where 1,000-year time-spans are accepted as a matter of course. Standing at the edge of a chasm 30 centuries deep, the whirl of temporal vertigo can overwhelm. And close on the heels of this realisation comes a second one: if mankind’s distant past is this immediate and real, then so, too, must be our distant future. I’m writing this essay from an apartment in Belgrade, the capital of Serbia. From my balcony, I can see the ruins of a Roman fort; a medieval castle; several Orthodox churches built in the 17th century. Across the highway, new skyscrapers rise like megaliths from the skyline of ‘New Belgrade’, and Boeing jets streak across the clouds. And through the middle of all this flows the Danube River, which was here long before any of us arrived, and will nourish the oaks and elms along its banks long after these buildings have crumbled to rusted skeletons. When we find ourselves taking a childlike view of our place in history, we would do well to take a lesson from those scribes of 3,000 years ago, and recognise that the timeline stretches as far behind us as it stretches ahead. For proof of this, we have only to look to Eridu and Pompeii and Tenochtitlan, and a hundred other dust-swept ruins whose inhabitants hoped their empires would endure forever – but must have known, on some level, that they would not. As Bradbury’s theme park reminds us, only when we feel the reality of the past can we fully recognise the fragility of the present – and plan in earnest for the sake of far-distant days yet to come.